Pop Up Pizza offers downtown-style pizza, made with fresh and simple ingredients. A refreshing addition to the 89101 pizza scene, we’re located in the newly remodeled Plaza Hotel and our simple and modern decor is the perfect place to showcase our incredible menu. Our pizzas are bursting with flavor from our incredibly fresh ingredients and highly imaginative pizza recipes. In addition to pizza, we offer fresh salads, tasty appetizers, cold beverages like beer, wine, and soft drinks, and vegan soft serve ice cream. If you want delicious pizza, 89101 is the way to go! The Soho: a vegan pizza, made with vegan mozzarella, spinach, mushrooms, artichokes, and roasted bell peppers. If you can’t stop by the store, no sweat, we deliver. 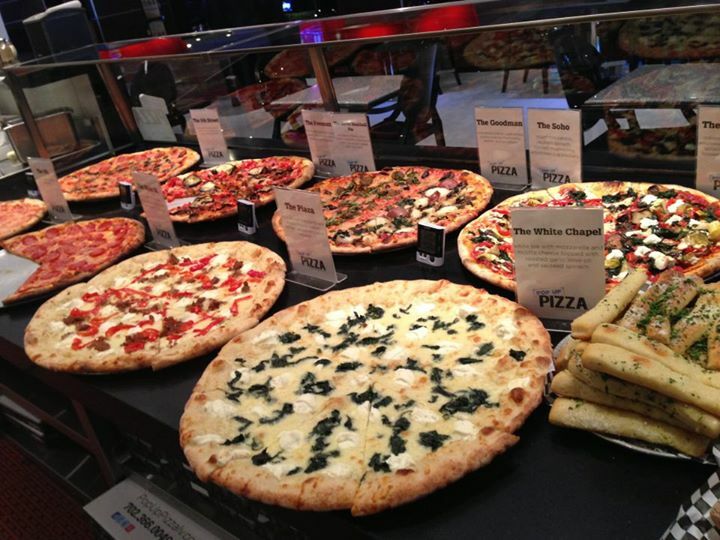 We’re open daily from 11 a.m. to 2 a.m., and we’re the downtown Las Vegas pizza option of locals and tourists alike. We sell by the pie or by the slice. Contact us today at (702) 366-0049 and see why Las Vegas is buzzing about Pop Up Pizza.